I LOVE The Dark Knight. It is simply the best movie of all time. From the epic opening bank heist, to the great story writing, and even the wonderful performances performed by the actors. It is the BEST movie of all time. To begin, I’m going to talk about my favorite scene. The opening scene is epic, (just like the rest of the movie), the post-credit scene in Batman Begins already set it up who the villain would be, the opening scene doesn’t tell you who the person who orchestrated the bank heist, but true fans already know who it is, and at the end of the scene when the joker reveals himself, only makes it, oh so satisfying. All in all, I would give the movie 10\10 just on the opening scene alone, that’s how you make a good movie folks. Don’t think I am going scene by scene, nope, I am talking about my favorite parts, so what is my review. I love the acting in this movie, while Heath Ledger did have THE BEST performance, I think Aaron Eckhart had the harder role to fulfill. For one, he practically played two characters, now I know some actors have done it before, but he did it justice. First off, he goes from being a character that is all for the law, but after Joker captures poor old Harvey and Rachel (both Harvey and Bruce’s love interest) Batman interrogates Joker, and gives the addresses of them both, so he goes for Rachel (or maybe Harvey)but little does he know that joker switch the addresses (or maybe he did know) so he ended up saving Harvey, but Harvey still got half of himself burnt. Now at this point, Harvey has a change of heart, and becomes two-face. This is when he switches sides, and becomes evil. Now at this point you must be thinking, what more can this man say, WELL I STILL HAVE MORE Joker. Yep. I’m talking about the villain of the story. To be honest, I kind of have to. In my opinion, he is the best part of the movie, always being one step ahead of the Batman, unpredictable. He is one of if, not the best villain of all time. With an amazing performance by Heath Ledger under his belt, that and one of the coolest character motifs of all time, he and his movie make it into most people’s top 10 villains of all time, or top ten superhero movie villains, top ten films of all time even, and I have to say I agree with them. When I first watched the film in 2010, 2 years after it came out, and remember, I was watching this film because I heard a new Batman movie was going to come out, and I was a huge fan of Batman. After I watched the film, I was like, THIS IS THE BEST MOVIE EVER, and yes I actually yelled that out. And since I talked about the villain (barely) it would make sense to talk about the main protagonist (no not commissioner Gordon) BATMAN. Christian Bale’s Batman is by far the best adaptation of Batman ever to be on any screen. I took this poll thing a while back for which Batman was the best, and Christian Bale’s Batman won, OH YEAH. While Affleck’s Batman may win the death battle, Christian Bale won in the box office, plus he’s way smarter, plus everybody loved The Dark Knight, and when Batman vs. Superman came out, EVERYONE WAS MAD, even Rotten Tomatoes, who I usually disagree with (even though I would have given it lower) I agreed with low and measly 27%, which is considered rotten, COMPARE THAT TO A VERY STRONG 94%, OH YEAH, it got what it deserved. Back to Batman. According to almost everybody, (yeah, I’m talking to you James) Batman is #1, and this film helps prove that. Batman vs. Superman was trash. When imagining Batman and his on screen appearances, most people turn to The Dark Knight’s interpretation of the Batman which further proves that it is the greatest Batman appearance. 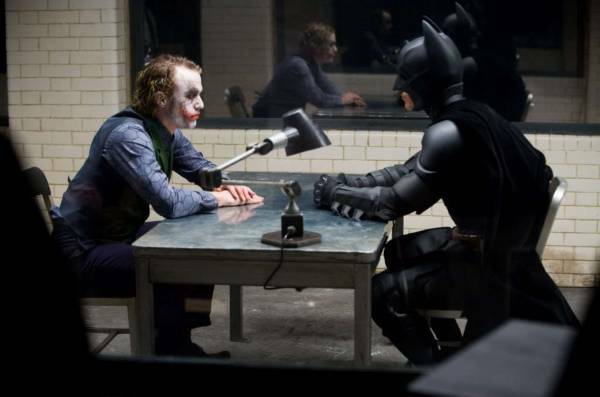 At the end of the day, whether you like it or no, you have to admit, The Dark Knight is one of, if not the greatest movie of all time. Be good people.